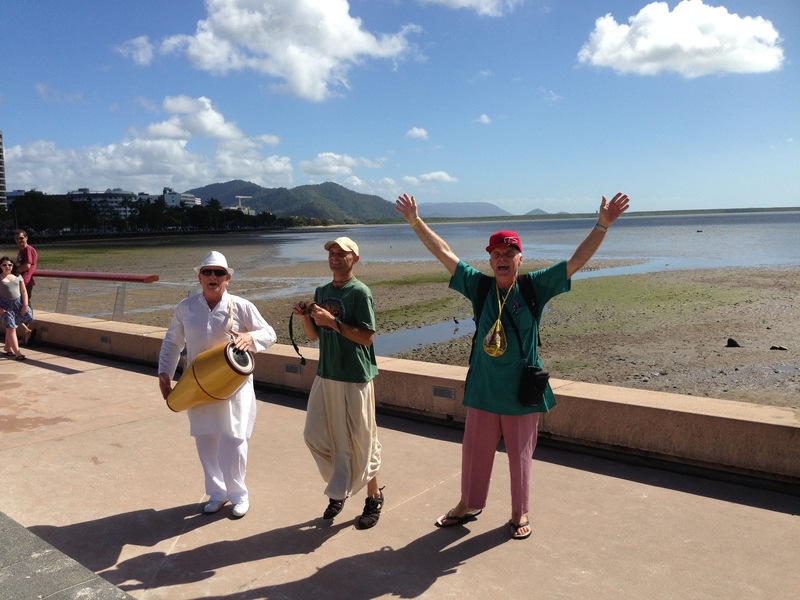 Harinam Sankirtan in Cairns, far North Queensland, Australia for about 90 minutes, on the occasion of “ le quatorze juillet 2013 ”, the French national anniversary day of the liberation of the Bastille prison in 1789, with Rupa Ragunath Prabhu, a disciple of HH Tamal Krishna das Goswami and Vishnupada Prabhu, a spiritual descendant of His Holiness Sridhara Maharaja, the celebrated Godbrother of the Founder-Acarya of the International Society for Krishna Consciousness, His Divine Grace A.C. Bhaktivedanta Swami Prabhupada, while Rathayatra was going on in full swing in Brisbane. Similarly Krishna Consciousness is also a struggle and fight with maya for liberation from the prison house of the material world. “The word manasi refers to the mind. When one is enlightened in bhakti-yoga, the mind becomes completely freed from all contamination (samyak pranihite ‘male). When Vyasa saw the Supreme Personality of Godhead, he saw maya in the background (mayam ca tad-apashrayam). Whenever there is light, there is also the possibility of darkness being present. That is, darkness is the other side of light, or darkness is under the shelter of light, just as if I hold my hand up to the light, the top part of my hand will be in light, and the bottom part will be shaded. In other words, one side is light and the other darkness. When Vyasadeva saw Krishna, the Supreme Lord, he also saw maya, darkness, under His shelter.” The Path of Perfection. Cairns is a “natural” Harinam City. Param Vijayate Sri Krishna Sankirtanam!